The terroir of Chignin under the "Savoyarde mountain"
Our vineyard is located in the Savoie wine area. This area (2200 ha = 5436 acres) represents 0.26% of the total French vineyard (835 805 ha = 2065319 acres). The "Chignin" appellation inside of the Savoie area represents 10% of the total Savoie wine. That is where the Vignoble de la Pierre is located. The Vingnoblde de la Pierre is hung on the mountainside taking care of 11 ha = 27 acres acres of different varieties such as Mondeuse or Bergeron (Roussanne). All the grappes are growing on the Tormery hill, which is one of the most famous hill in the Savoie appellation. Since 1988 Yves Girard Madoux is the Owner of this beautifull independant estate. After a lot of work from his father René Girard Madoux who believed that the Tormery hill was the best place for a vineyard. René was one of the first men who planted vines on this hill (1960) knowing perfectly the hard work in the mountain. Yves's philosophy is to impact as less as possible the soil, that is why we are not using any chemicals on the ground and we are working with mecanical tools to cut the grass between the vines. Now Yves is working with a young winemaker, Elie Talaga he is learning him everything about his vineyard and maybe in few years Yves will stop his activity and let Elie continue this adventure. The HVE Label level 3 is now in the Vignoble de la Pierre ! Since 2019, our vineyard is the third in Savoie to become a High Environmental Value Vineyard and Winery. • Strengthening Biodiversity by adding birdhouses and bathouses (to be abble to fight the insects day and night. •A technical itinerary in the vineyard and the cellar adapted to environmental requirements. For 10 years we've banned herbicides, insecticides and are working without any CMR because we think that the copper used in the organic label is a mistake for our soils. We consider the estate as a globality, and we are considering all the living part of the estate such as the birds, the trees around the blocks ans the living organisms in our soil. We are proud to do a job where we can work close to the environment and respecting it, we also think that a living soil is the only way for high quality wines. Since 1960, René Girard Madoux was one of the first men to to grow vines on Tormery Hill. Discover our story. 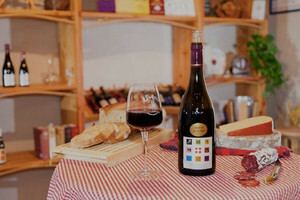 Come and join us for a wonderfull wine tasting with some Savoie products. Take an appoitment and visit us. A typical and rustic variety that you will only find in Savoie area. Discover our Mondeuse wine. Ont Tormery Hill, Chignin Bergeron wine is now one of the most famous in Savoie. Come to discover this wonderfull wine. Wine producer "AOC vin de Savoie"